Mock Orange (Philadelphus): growing, planting, caring. Did you know? The name ‘Mock-orange’ is due to their flowers, which in wild species look somewhat similar to those of oranges and lemons and smell of orange flowers and jasmine. 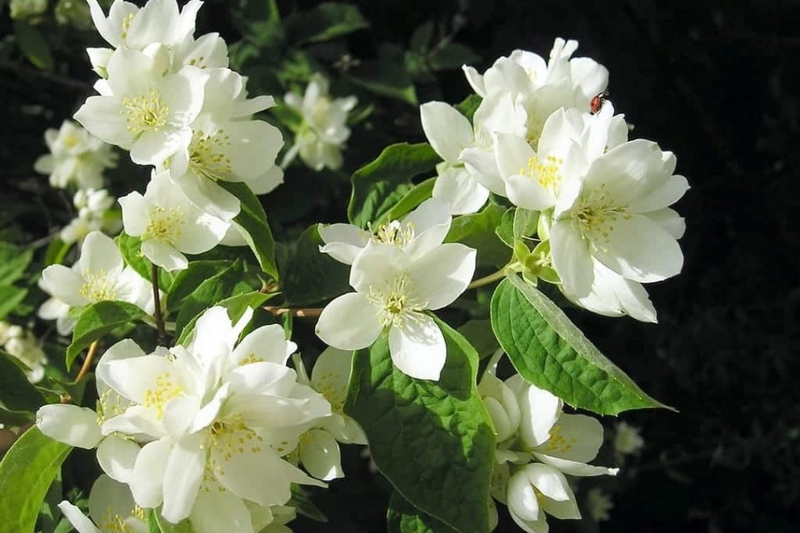 Philadelphus - the mock-orange - is a genus of about 60 species of shrubs growing 3–20 ft (1–6 m) tall, mostly native to North and Central America. Most species are deciduous but a few species from the south of the genus' range are evergreen, with opposite, simple, 0.5-6 inches (1–14 cm) long leaves with serrated margins, and white flowers, usually sweetly scented. Mock-oranges are popular shrubs in parks and gardens, grown for their reliable display of late spring flowers, and there are numerous garden origin hybrids and cultivars available, selected for doubleness and large flowers, with some compromise as to scent. The syringat - Philadelphus - is a flowering shrub that can grow up to a few meters, deciduous, oval, opposite, slightly toothed, 3 to 10 cm long. The flowers, numerous, solitary or grouped by two or three at the end of the secondary shoots, are white and appear in May-June spreading a very distinct perfume! Its name comes from an ancient use that was to hollow out the stems of their marrow to make syringes! There are some 40 species that grow naturally in the temperate countries of the northern hemisphere but it has been improved by nineteenth century gardeners who have created particularly fragrant hybrids! The species Philadelphus coronarius is appreciated for its hardiness of perennial plant: it is grown isolated or hedged, or even on balconies, especially for its characteristic fragrance that embellishes gardens and parks in the spring, which earned him to be nicknamed the "jasmine of poets". Plant your syringat, in autumn or spring, in semi shade or in a moderately sunny location - at least not in the scorching sun. It will accept any spot provided that the soil is well drained, and it does not need to be installed in a shelter. You can grow it as well in open soil, where it will grow quickly without special care, or in vats for small varieties. If your land is heavy, add coarse sand and compost to it when filling the hole. If you have planted in the spring, you may need to water regularly the first year until the fall. Water your syringat the first weeks after planting, especially if you have planted it in the spring. Water also in case of hot weather or prolonged drought, and of course if it is in a pot. You will notice that it needs water when the leaves sag slightly and become softer! Your syringat can very well do without pruning, it has a nice habit! Nevertheless you might want to keep it in a particular shape. Avoid to prune the first years: let him have some time to acclimatize, and start to bloom! Afterward, cut in July or August, after flowering precisely, by folding by one third branches deflowered, above a branch or a bud. Remove dead or diseased woods and badly oriented or overlapping branches. Syringe - especially in pots! - will appreciate the contribution of compost in the spring if you see signs of weakness. The syringats are quite hardy and do not need protection in winter, however, you can bring them some compost in the spring or a mulch, they will thank you! The syringat is hardy except against the aphids that seem to particularly like it. Watch for it and intervene as soon as the first aphids appear, avoiding the use of insecticides that are toxic for the environment. Prefer the use of softer solutions, such as non-calcareous water spray mixed with baking soda (at a rate of 5 grams per liter of water) and some black soap!